Looking for an interval training program to accelerate your fitness training? Fitness training for most people comprises a workout of continuous exercise at a constant intensity. This type of training is very effective but, to propel yourself to the next level of fitness, you need to incorporate interval training into your fitness training regimen. You will burn more calories, increase your speed, strength, endurance, motivation and overall athletic performance. The concept of interval training has been around for years as the basis for athletic fitness training routines. Originally called Fartlek, it combined alternating short and fast bursts of intensive exercise with the slower, easier activity of continuous work. Fartlek training was a deliberate attempt to complete more work than continuous training by increasing the intensity of workouts. Interval training has since evolved into a more structured and sophisticated way of fast tracking your fitness training. Unlike Fartlek training, which causes a temporary build-up of lactic acid, interval training now involves alternating periods of activity and recovery. Recovery is achieved by maintaining movement throughout the entire workout. This facilitates the removal of the lactic acid from the muscles through to its conversion into energy. Interval training programs are now easily adapted to suit most sports. This is done by manipulating the intensity and duration of the work intervals, and the length of the rest periods, to create the desired training responses. A complete interval training workout usually comprises several short, alternating periods of both higher and lower intensity exercises. Interval training programs are also designed scientifically and specifically for individual athletes. Physiologists and trainers measure precise periods of activity that match the athlete’s sport and current level of fitness. For example, the intensity and duration of these periods of activity are usually determined by AT (anaerobic threshold) testing, which also measures the blood-lactate of the athlete during intense exercise. During the intense periods of activity, interval training works repetitively on the aerobic and anaerobic systems. The anaerobic system metabolises energy stored in the muscles (glycogen) for the short bursts of activity without needing oxygen. Lactic acid builds up as the by-product and the athlete experiences oxygen debt. The body is then allowed to recover with the heart and lungs working together to give back this oxygen and to break down the lactic acid. The aerobic system takes over using oxygen to convert stored carbohydrates into energy. New capillaries are built taking oxygen to the muscles to strengthen them, including the heart muscle. The combination of an improved cardiovascular system with muscles that can tolerate lactic acid build-up significantly improves athletic performance and well-being. Injuries associated with long-term, repetitive exercises are significantly reduced due to lack of overtraining or burn-out. Overall aerobic power and fitness levels are improved. Helpful when trying a new form of exercise or activity. Allows you to gradually build up to the continuous activity in a much more enjoyable and effective manner, without tiring too quickly. Also, interval training can be applied to all levels of fitness training – for beginners, intermediate exercisers and conditioned athletes. There are two basic types of interval training. The Fitness Interval Training technique is recommended for beginners and intermediate exercisers. This training method uses periods of increased intensity that usually last from 2-5 minutes, followed by lower intensity periods of the same duration. When determining the higher intensity periods, it is vital that the levels should not exceed the anaerobic threshold of below 85% heart rate reserve. The Performance Interval Training technique is more advanced and is recommended for conditioned athletes. This training method uses periods of maximum intensity (85% – 100% heart rate reserve) that usually last from 2-15 minutes, followed by lower intensity periods of the same or shorter duration. The following examples of interval workouts illustrate how easily interval training programs can be adapted to suit most sports or activities. By manipulating the intensity and duration of the work intervals and the length of the rest periods, specific training responses can be achieved for their specific activities. Jumping Rope Workouts are an inexpensive and fast way to build overall fitness. Besides improving cardiovascular fitness, they can improve muscular strength, endurance, balance, agility and burn calories. 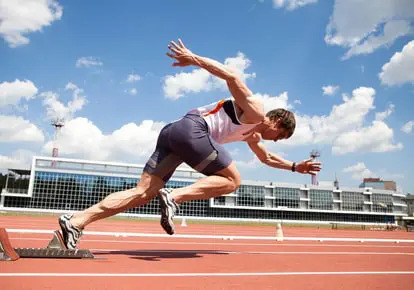 30-Second Sprint Drills improve aerobic capacity and fitness fast by giving the same benefits as long, slow cardio workouts in about half the time. Popular among all exercisers because it works. 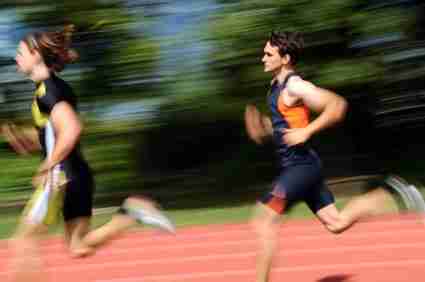 Sprint and Speed Training Drills benefit any sport by offering a combination of speed and endurance. Start only after 3 months of consistent athletic activity and after you have reached a fitness training level that allows you to run for 20-30 minutes at a time. Explosive Exercise Training routines are another way to increase power and strength. Used by elite athletes in sports that require fast burst of maximum effort in a short amount of time, such as sprinting and jumping. Agility Drills improve coordination, speed, power and sports skills for athletes. These drills also help perfect foot speed and refine sports technique. Shuttle Runs are standard agility and speed drills for athletes playing stop-and-start sports such as basketball, soccer, hockey and tennis. Stair Running is an advanced program that helps build speed, power and cardiovascular fitness. A great addition to any agility training program for its quickness, foot speed and excellent sprint workout. Plyometric Jumping Exercises are used by many athletes and trainers to develop athletic power (strength and speed), coordination and agility for increased sports performance. Tuck Jumps are simple drills that build agility and dynamic power to increase an athlete’s vertical jump. Used to develop proficiency in vertical, high, box and long jumps. Interval training is a fantastic form of exercise, however, the most common problem associated with interval training is that people tend to get over excited, because of the intense nature of the exercises, and push themselves harder than they normally would. This tends to result in sore muscles and joints, and an increased likelihood of injury. Below are a few precautions you need to take into consideration. Set a training goal that is realistic and within your current fitness level. Use a safe warm up routine before starting your intervals. Start slowly and work toward longer intervals to provide better results. Maintain a steady but challenging pace throughout the interval. Increase the repetitions over time. Reduce your heart rate to 100-110 bpm during the rest interval. To step up your fitness levels, increase the intensity or duration, but not both at once. Extend any increases slowly over a period of time. Train on smooth, flat surfaces. And don’t forget to incorporate regular stretching and flexibility training into your fitness program. The added intensity of interval training requires that your muscles and joints be flexible and supple. Sprint Workout: Perform this workout two to three times a week with plenty of rest between workouts. Warm up for 5-10 minutes. 1st Sprint at about 60 percent maximum intensity for about 200m (adjust the distance according to your fitness level and experience). Recover for 2 minutes by slowing down to an easy jog or a walk. 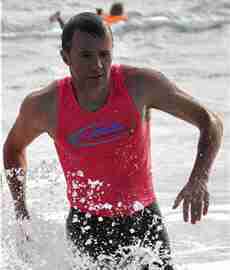 2nd Sprint at about 80 percent maximum intensity. Perform the remainder of your sprints by pushing yourself all-out for each sprint. Recover for 2 to 4 minutes after each remaining sprint. Start with 4 sprint/recovery routines building up to 8 routines depending upon your fitness level. Have a Workout Goal of six workouts in two weeks down to twice a week for maintenance for six to eight weeks. Allow 1-2 days of rest between sprint workouts. Follow precautions and safety guidelines listed above. The Shuttle Run: For sports such as soccer, hockey, basketball and tennis. Set up markers 25 yards apart. Sprint from one marker to the other and back for one repetition. Do 6 repetitions at maximal speed and time your results. Rest for 5 minutes making sure you are still moving. Repeat the drill once more. Add the 2 times then halve it to find the average time. Test monthly to track your progress.